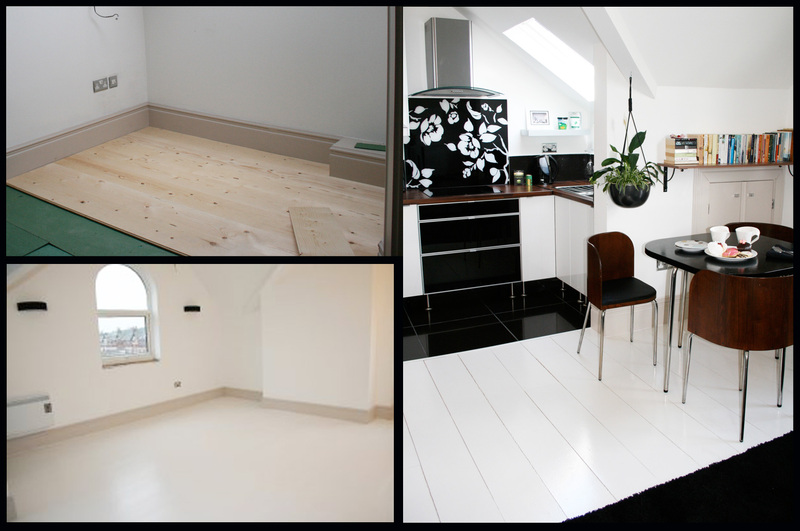 Blog post from April 2009: I know some people may say it’s not sensible to specify white flooring in a rental flat but I really wanted that brilliant white look to add to the feeling of space and light. Solid wood such as limed oak was too expensive, pale carpets mark far too easily in your average rentals and laminate can have sound issues in older buildings….. so when Fallowfield Timber sourced me 36m of 9″ T&G pine boards grooved underneath to prevent the wide boards warping, for just under £300 I was sold! Fitting and the extra time were a cost consideration but it still worked out the best price wise option. To get the final finish I used: knot sealant over any knots to prevent oil coming through the water based paint & varnish; two coats of B&Q bare wood primer which acts as both primer and undercoat; 120 paper to lightly smooth in between coats; white spirit to lightly wipe the boards clean of dust; two coats of Dulux Diamond Eggshell in brilliant white. I used this water based paint because oil based whites slowly go yellow as the oil comes to the fore and nicotine-style floors are not high on my list of design aspirations! Finally I sealed the floor with two coats of Ronseal Diamond Hard floor varnish. I opted for a gloss finish but you can chose Satin or Matt dependant on the look you want to achieve. N.B. FOUR YEARS ON, MARCH 2013 : The floors still look amazing and remain brilliant white. They’re easily scrubbable between tenancies and always come up looking sparkling after a wipe over with Cif. Due to the softness of modern inexpensive pine, heels have made indentations but I don’t mind that so much. I’d have allowed a longer time for the pine to rest and acclimatise in the flat as gaps have appeared between boards but this is not a massive problem in this rented property. If you want perfection, allow at least 2-3 weeks acclimatisation for your newly bought timber to dry out and shrinker use engineered board or kiln dried timber. But then of course, your costs go up! Must admit Sian, that having read the initial coating system you used, I thought ‘that’s a disaster waiting to happen’ i.e. varnish over eggshell on a floor, and white at that. More fool me, as it sounds like it was a brilliant success! Who needs floor paint! Great work as always and lovely Pinterest pics! To be honest I was unsure about water based eggshell myself, but both on the unvarnished skirtings and the varnished floors, it’s lasted a treat. Phewf! Would this work on laminate …My son has been looking after our place and has coverd it in laminate !!! He though we would be pleased bless him !! I was wondering exactly the same thing Susan. I suspect that a lot depends on the quality of the laminate (thickness, porosity, existing finish). Did your son try painting the laminate? Sian, great post. Can you expand on how you laid the floorboards. Did you use any underlay, and what glue did you use to fix each floorboard to each other? Hi Max, as the flat is on the second floor and there’s a bedroom below, we insulated between the floor joists under the original timber floor, then used those green underlay boards and laid the wide pine planks on top. They were secret nailed in situ as they were laid, rather than glued. My absolute best tip is to leave any new pine in the room it’s to be fitted in for several weeks with the heating on and off to allow it to acclimatise as it moves so much. We have still had movement and now have some gaps but I’m not so fussed as it fits with the design look. If you don’t want any gaps at all, maybe fresh pine isn’t the best to use, or ensure what you’re buying to fit won’t shrink – e.g. engineered board, kiln dried. Hope that helps! Hi, did you sand the eggshell before you applied the varnish to the floor? A very light rub over never goes a miss but no, from memory, I didn’t do at the time. Very naughty of me, but hasn’t seemed to make a difference! Thanks for the details Sian. This is the only post that I can find where someone has used eggshell paint and then topped with a varnish for painting floorboards. I am in the process of buying a flat where I want to paint the pine floorboards white, but all other suggestions note using a knot treatment, primer and three coats of dedicated floor paint (such as Ronseal Diamond Hard floor paint). Was it recommended to you to put a varnish on? I am looking for a more satin/matt finish. Additionally, the Ronseal floor paint notes it is non-slip. As part of my painted floorboards will be the stairs, this is a desirable quality but I am conscious of long term wear and therefore thought a top coat of varnish would be best to finish the job. Hmmm difficult. Hi Tony, barely any waste as the boards were grooved underneath by the timber merchants. Try your local independents as they tend to be more flexible on having extra wide pine flooring made bespoke than the chains. Hi can I paint white eggshell straight over my glossed white floorboards.I painted them a few months ago and they have already gone yellow.what is the best paint to stay white and last. Hi Kat, I feel your pain, been there myself. I would recommend lightly sanding the full floor to ensure there is a proper ‘key’ for the eggshell to stick to, or it may peel. Hand sanding just to lightly scratch the surface should do it, maybe a 180 grade paper. 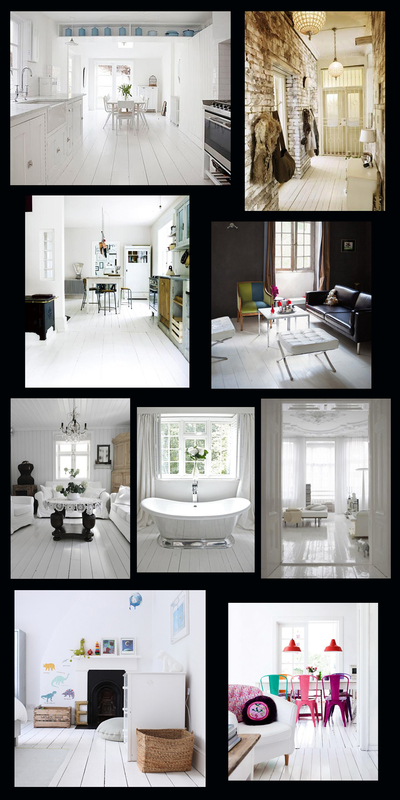 I used Dulux water based Diamond Eggshell six years ago and it’s still brilliant white, with sunlight streaming in. Top stuff! On that one I think I used a yacht varnish which wasn’t water based but it was a while ago and there weren’t as many water based products out there. It’s still going wrong in 2016! I varnished Ronnie, because it gives a stronger finish especially for floors!